Altriset termiticide from Syngenta Professional Pest Management (PPM) is now labeled for control of drywood termites, in addition to Eastern subterranean and Formosan termites. To provide the PMP with greater flexibility in controlling termite infestations, the updated label also includes an expanded application rate range option to increase the amount of active ingredient per finished gallon of solution, from 0.05 percent to 0.1 percent. Upon application, Altriset paralyzes the mouthparts of termites within hours of exposure, stopping further damage. Its exclusive mode of action increases termites’ aggregation and grooming behavior, which allows affected termites to expose other colony members to the product. 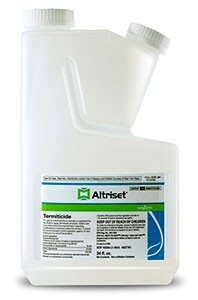 Used at labeled rates, Altriset is sensitive to beneficial soil organisms, like earthworms. To control drywood termites, Altriset can be applied as a foam treatment to penetrate difficult-to-reach areas, such as inside wall voids and structural beams.